Chair not included. Solid hardwood table built to last. Eco-friendly tables. Easy-to-clean. 0.75 in. Thick hardwood tabletop. Rounded edges for style and safety. Solid 1.75 in. square hardwood legs are steadfast. Available in different leg heights. Assembly Instructions. 36 in. L x 24 in. W x 20 in. H. 48 in. L x 24 in. W x 20 in. H. 48 in. L x 30 in. W x 20 in. H. A classic edition to any classroom, playroom, library or common area. 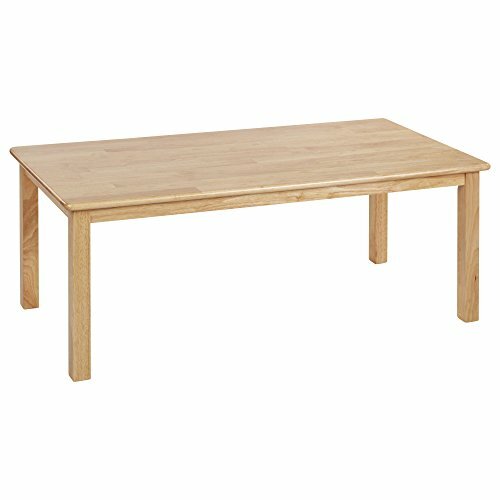 This durable, solid hardwood table is attractive and built to last. Tabletops are beautiful, easy-to-clean and have smooth, rounded edges for style and safety.